Governor Akinwunmi Ambode’s dream of securing a second term ticket on the platform of the ruling All Progressives Congress (APC) may have been finally dashed. Yesterday, one of the aspirants, Dr Femi Hamzat, who is from the Justice Forum, one of the prominent tendencies that influence the direction of things within the party in Lagos, withdrew from the race and endorsed Ambode’s main challenger, Babajide Sanwo-Olu, who is from the Mandate Group, another influential group within the Lagos APC. With the coming together of the two main groups, Ambode’s chances became slimmer as at press time yesterday. This is even as his woes were also compounded after 36 out of the 40 members of the state House of Assembly yesterday rejected his candidature and endorsed Sanwo-Olu. The lawmakers took the decision at an emergency session held at the Lateef Jakande Hall in the Lagos State House of Assembly complex, presided over by the Speaker, Mudashiru Obasa. According to a statement by the chairman of the House Committee on Information, Strategy and Security, Adefunmilayo Tejuoso, out of the 40 members of the House, 36 were present and all of them endorsed the decision and duly signed the statement announcing it. The lawmakers stated that they were in agreement with the leadership of the party and the Governor’s Advisory Council (GAC), which had earlier endorsed Sanwo-Olu for the governorship ticket. “At the parliamentary meeting held on 29th September, 2018 at the Lagos State House of Assembly Complex, members do hereby unanimously resolve to support the position of the leadership of All Progressive Congress (APC) and the Governor’s Advisory Council (GAC) in Lagos State on the endorsement of Mr Babajide Sanwo-Olu as the APC gubernatorial candidate in the 2019 election,” the lawmakers said. However, two APC lawmakers from the same constituency with Governor Ambode; Segun Olulade, Epe Constituency 2 and Abiodun Tobun, Epe Constituency 1 were absent at the meeting, while the third lawmaker, Sikiru Osinowo, Kosofe Constituency 1, was said to be out of town. Also yesterday, major stakeholders of the party officially endorsed Sanwo-Olu as their preferred candidate. 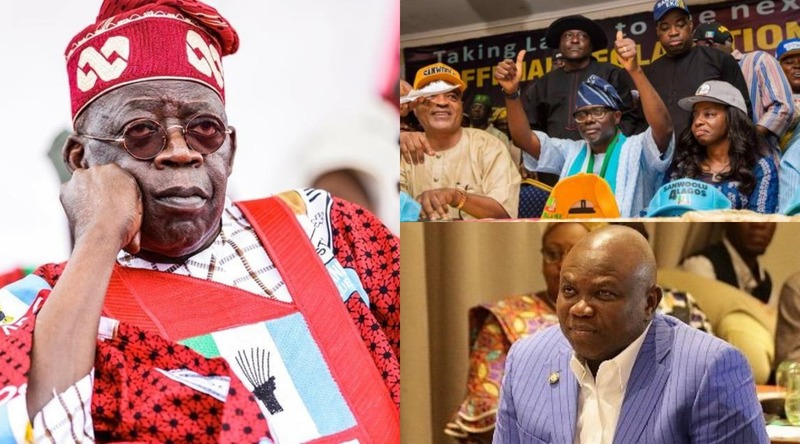 But the emissaries mounting pressure on the National leader of the party, Asiwaju Bola Ahmed Tinubu, to reconsider his stance on Ambode, are still putting in last minutes efforts to save the governor. It was gathered that one of the options being considered to give the embattled governor soft landing was to hand him the Senate ticket for Lagos East. But it was not clear as at press time if the governor will be willing to take the ticket as he was still insisting on running for the governorship. Addressing journalists at the Ikoyi residence of Sanwo-Olu, in Lagos yesterday, where he formally withdrew from the race, Hamzat, who until he signified interest in the governorship race, was a Special Adviser to Works, Housing and Power Minister, Babatunde Raji Fashola, urged his supporters to vote for Sanwo-Olu, in tomorrow’s primary election. Describing Sanwo-Olu, a former Commissioner for Establishment, Training and Pensions, as a man of “integrity, great humility and extraordinary intelligence,” Hamzat also recalled that both of them had worked closely with former Governor Tinubu, his successor, Fashola, and Vice President, Prof Yemi Osinbajo. Responding, after raising his hands up for the symbolic endorsement, Sanwo-Olu, flanked by his wife, Dr Ibijoke Sanwo-Olu, his campaign DG, Mr Tayo Ayinde and Otunba Lekan Osifeso, thanked Hamzat for endorsing him. With Hamzat’s withdrawal, if Ambode insists on fighting till the end, the battle for the ticket will now be a straight one between him and Sanwo-Olu. It was also gathered that the APC as a party in the state had met yesterday and foreclosed the possibility of Ambode running for next year’s governorship on its platform, following its official endorsement of the candidature of Sanwo-Olu. Vice President Yemi Osinbajo, Asiwaju Tinubu, GAC members, Speaker of the state House of Assembly, Mudashiru Obasa and other major APC stakeholders were said to have met by 10:00 a.m yesterday at Tinubu’s Ikoyi residence to deliberate on the endorsement. But Governor Ambode was reported to be absent at the meeting. After the meeting, which lasted for over three hours, a member of GAC, Senator Anthony Adefuye, announced the decisions that were reached at the party’s state secretariat. He said: “After a long meeting which was attended by Vice President Yemi Osinbajo, our national leader, Bola Tinubu, GAC members, the Speaker of the state Assembly, Mudashiru Obasa, and other stakeholders, we decided to shift the governorship primary to Monday, October 1, 2018. Sources within the APC revealed that part of the negotiations was that Hamzat, a former Commissioner for Works in the administration of Fashola and his close ally, would emerge as Sanwo-Olu’s running mate, an indication that the factions within the state APC may have been resolved.